Aerial group of cubic-shaped crystals with small octahedral faces and parallel polycrystalline growths. They are bright, with vivid iridescences of dominant blue and green shades. An excellent classic, an “oldie” of English mineralogy. This specimen merits a careful description. 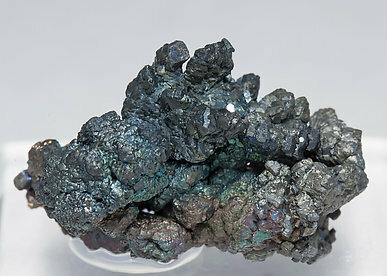 Bornite crystals usually tends to be small, black, ugly and not very sharp. 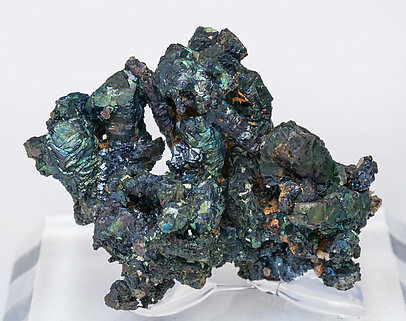 Well, this specimen shows is colorful nature due to an iridescent alteration of a thin covering, its crystals are pretty huge and extremely sharp for the species. You can appreciate its beauty in the photo. 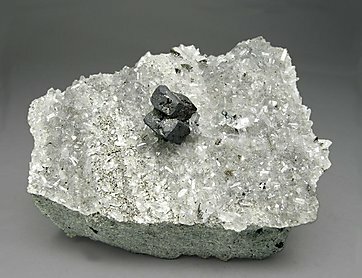 Plus the specimen is a floater with a small Bornite crystal just on the top corner of the specimen. Just great! 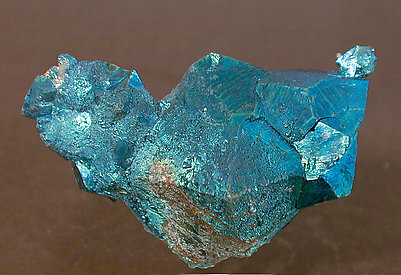 Aggregate of small crystals with very well defined faces and edges, and with iridescences of a dominant bluish color. A good thumbnail of an English classic. Very unusual crystals of Bornite on quartz - we have never seen another specimen with this crystallography from this locality. Well positioned on the quartz and esthetic.